PELHAM, AL – A huge game-one win, blowing out Birmingham 4-0 took the series to Alabama. All the Marksmen need is one win in the next two games to go past the Bulls and move on to the semi-finals. Fayetteville had been in this arena just two weeks ago, getting blown out in both contests. Looking for a repeat of Friday, the Marksmen got going. The game started off at a snail’s pace. Only three shots on net in the opening six minutes of the contest. A Fayetteville penalty ended up being the catalyst of the shooting, the Marksmen killed it off after four Birmingham shots. The Marksmen finally got their first shot on net, over eight minutes into the game. Their single shot didn’t start much, as Fayetteville got called for another penalty. This penalty, similar to the last got killed off, but not before facing a trio of Birmingham shots. The whistle got blown again for a few more penalties, not in favor of the Marksmen. This penalty kill didn’t go as well as the last, it took only 45 seconds and a single shot for the Bulls to find the net. They scored their first goal of the game, giving them the lead in a game they’ve dominated so far. A few more shots from Birmingham got fended off by Fayetteville, then the dice rolled in favor of the Marksmen. With 1:45 left in the opening period, the Bulls got whistled for a penalty. The Marksmen finally got a chance to bring their league leading power play team on the ice. They didn’t disappoint; on their only shot of the power play, only the sixth total in the period, Sam Wilbur sent one into the net. With the game tied at one, the Marksmen finally had some momentum going into intermission. Having been outplayed in all aspects of the game, but still being tied on the scoreboard, Fayetteville had work to do. A pair of penalties made the game four on four for two minutes. Birmingham tried to score, with four shots during the penalty but failed to do so. Just under two minutes after the last Bulls shot, the Marksmen found their mark. On only their second shot of the period, the Marksmen scored. Brian Bowen found the net, giving Fayetteville a 2-1 lead. Another series of penalties gave both teams an opportunity with a man advantage, neither could convert. It took all the way to the six minute mark for more offense. Birmingham was sick and tired of being down on the scoreboard while being up in all other aspects. They flipped the script at the six minute mark when they tied the game back up at two goals a piece. They kept control of the game for the rest of the period, with a penalty being the only thing happening for the Marksmen in the final five. The second period was terrible for the Marksmen as they had only five shots on net for the entire 20 minutes. They had eight penalty minutes to Birmingham’s six. Fayetteville was really lucky to even still be in the game. The final period got underway and the Marksmen were still 20 minutes from a sweep, even with the lackluster performance. All they needed was one to make the Bulls stay in Pelham empty handed. Neither team could do much of anything in the first half of the opening period. Only eight shots found the net and a pair of penalties were called. While Fayetteville couldn’t do anything with their advantage, Birmingham could. Just before the halfway point of the penalty, the Bulls found the net. They took the lead with just under 10 minutes to play. That goal got the Marksmen offense going. After going behind, Fayetteville started getting the puck towards the net. They accounted for seven shots on goal in the final 10 minutes, more than the entire first or second period. Even with the higher output of shots, they couldn’t get any to go their way and find the net. Fayetteville pulled the goalie and tried all they could, but it didn’t work. 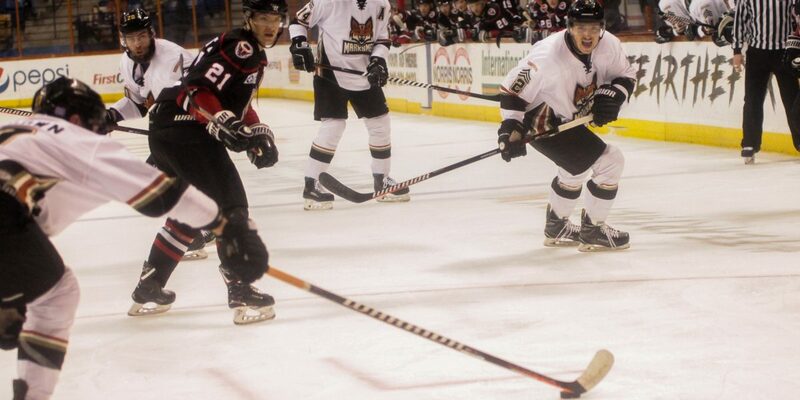 The Marksmen fell 3-2 Saturday night in Pelham. The loss being their first ever in the postseason. These two teams now play a pivotal, winner take all game three in Pelham Sunday night. A trip to the semi-finals on the line, the Marksmen will be ready.